Welcome, BookDragons to Day Five of my second blogaversary! 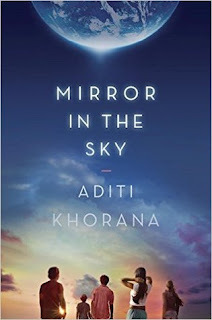 Today, I have an author with the SAME NAME as me, so welcome Aditi Khorana, debut author of Mirror in the Sky, a Young Adult Contemporary novel! She's here answering some awesome questions, and giving away an ARC of her book, and some temporary tattoos! I’ve read them all multiple times. I read God of Small Things every year. 2. If you were a TV show, which one would you be? Probably Six Feet Under because it explores the unknown, is funny, irreverent, complex and moving and is based in Los Angeles – the city I live in. I pulled my car over, thinking I had discovered a new farmer’s market. I ran over to buy vegetables and got yelled at because the market was actually part of a movie set and they were rolling film. Definitely Italian. Love pasta, seafood, good wine. Princes. Eyepatches and scurvy are not a turn-on for me. British. They just sound better. I woke up in a state of total anxiety because I knew the book was going to go into auction. The entire week preceding the auction had been a roller coaster. A few days prior, I had spoken to my now-editor Jessica Almon for hours on the phone and had fallen in love with her and her amazing ideas for the book. She understood it in ways that gave me goose bumps. I really wanted Jessica and Razorbill Books to be MITS’ publishing home but my stomach had been in knots over whether they loved the book as much as I loved them. But by late morning the day of the auction, my agent had called to tell me that the team at Razorbill had indeed loved the book and by the end of the day, I was both relieved and ecstatic that Razorbill would indeed be MITS home. My parents were my first call. They were thrilled. My friends took me out to a celebratory dinner. It was one of the best days I’ve ever had. If you’ve ever felt like you don’t belong, if you’ve ever questioned your life choices, if you’ve ever considered (or obsessed over) the paths you didn’t take, MITS is for you - it’s a book about race, class and Otherness, and also a book about the Unknown and the sense of vulnerability that comes from not knowing all the answers and from waiting and seeking to understand the mysteries of the world. 7. What inspired you to write Mirror in the Sky? Before I wrote the book, I read Cheryl Strayed’s Rumpus column – The Ghost Ship That Didn’t Carry Us – and it inspired me to write MITS. It’s about choosing a particular path and simultaneously wondering about the one we didn’t choose. Since I was in my own period of questioning, having just finished a manuscript that was rejected by a number of agents, writing about another world inhabited by alternate versions of all of us felt like an idea that I was personally aching to explore. I was in a period of waiting – for my life to take on a particular shape, to find out if I was capable of fulfilling my own most cherished dreams. Writing MITS allowed me to explore these themes fully. Thanks SO much for doing this, Aditi! I find it immeasurably cool that we share the same name, YAY! 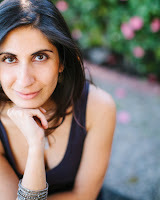 Aditi Khorana spent part of her childhood in India, Denmark, and New England. She has a BA in international relations from Brown University and an MA in global media and communications from the Annenberg School for Communication. She has worked as a journalist at ABC News, CNN, and PBS, and most recently as a marketing executive consulting for various Hollywood studios including Fox, Paramount, and Sony.Mirror in the Sky is her first novel. She lives in Los Angeles and spends her free time reading, hiking, and exploring LA’s eclectic and wonderful architecture. For more information, visit aditikhorana.com. Blurb Description: For Tara Krishnan, navigating Brierly, the academically rigorous prep school she attends on scholarship, feels overwhelming and impossible. Her junior year begins in the wake of a startling discovery: A message from an alternate Earth, light years away, is intercepted by NASA. This means that on another planet, there is another version of Tara, a Tara who could be living better, burning brighter, because of tiny differences in her choices. Win an ARC of Mirror in the Sky + Tattoos as shown in the picture! Giveaway open to residents of US/CAN only.